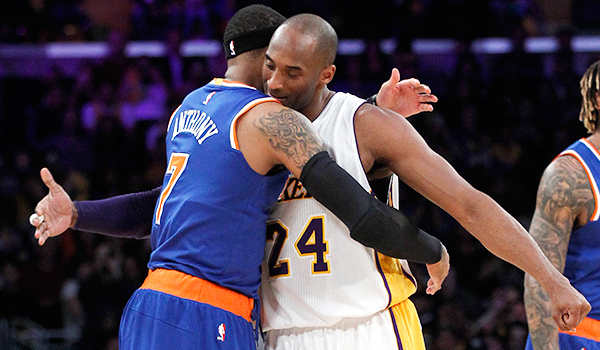 Retiring Los Angeles Lakers guard Kobe Bryant had some advice for New York Knicks fans: Trust Phil Jackson. LOS ANGELES — Kobe Bryant’s Farewell Tour has often doubled as a counseling session, with the Lakers guard dispensing wisdom and advice to friends and foes alike. This season, Bryant has encouraged the Warriors to chase 73 wins, urged Kevin Durant to “be the greatest,” and suggested that LeBron James should be “obsessing” over unseating the defending champs. The latest target of Bryant’s guidance: New Yorkers impatient with the Knicks’ progress under president Phil Jackson. Speaking after the Knicks beat the Lakers 100–97 on a last-second, game-winning three-pointer by Jose Calderon, Bryant fully vouched for Jackson, who assumed his current position in March 2014 after coaching Bryant’s Lakers from 1999 to 2004 and ’05 to 11. “What he does now is understanding personnel, picking the right personnel, but that’s no different than what he did as a coach,” Bryant said Sunday. “As a coach he really broke down the players, understood the players. That’s the same thing he does as a GM. Following a disastrous 17-win season in 2014–15, the Knicks (28–40) have made modest progress this season. Rookie Kristaps Porzingis, the No. 4 overall pick, has been a revelation, while off-season acquisition Robin Lopez has helped complement All-Star forward Carmelo Anthony. Still, the ’15–16 season has had its share of bumps: Jackson fired coach Derek Fisher in February, after just 136 games on the job, and the Knicks are the East’s 13th seed, seven games out of the playoff picture. What’s more, New York will not have its first-round pick in June’s draft. Bryant stressed that Jackson’s “true genius” lies in his ability to “set the table” so his players can reach their own conclusions. Under Jackson, Bryant won five championships and made seven Finals appearances, teaming with Shaquille O’Neal to win a three-peat from ’00–02 and then leading Pau Gasol, Andrew Bynum and Lamar Odom to back-to-back titles in 2009 and 2010. Before joining the Lakers in ’99, Jackson coached Michael Jordan’s Bulls from ’89 to 98, winning three-peats from ’91–93 and ’96–98. Jackson’s 11 championships as a coach are an NBA record. Bryant made it clear, however, that he has no tolerance for those who might nitpick or downplay the Hall of Fame coach’s role in the success of his teams. Sunday’s game marked the final on-court showdown between teacher and pupil, although Bryant told reporters he remains in regular contact with his former coach and he came to “see great reason” in Jackson’s signature “Zen” approach, which Bryant credited with honing “awareness” during his 20-year career. With his Lakers mired in the West’s basement headed to the lottery for the third straight season and staring at the possibility of a multi-year rebuilding effort following his retirement, Bryant added that he hoped, for everyone’s sake, the two prestigious franchises are headed for better days.